In case you haven’t noticed, the planet seems to be in some sort of Star Wars-inspired mania right now. We’re told that there is a new movie very close to being put on general release, or something like that. You would, of course, need to have been living in a big cave to have been able to avoid the Star Wars craze that is sweeping the internet these days, and now Google has managed to get in on the act after it released a cool little project that allows fans of the movie franchise to wave their smartphones around as if wielding a lightsaber of their very own. 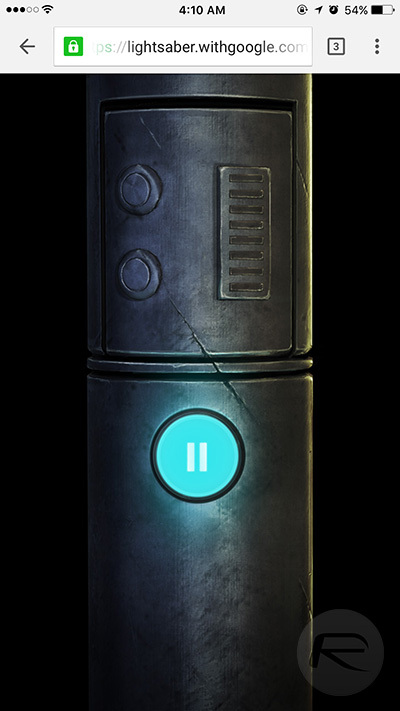 The game, named Star Wars Lightsaber Escape, lives in the Google Chrome web browser on the desktop, which then gives users a special URL that they then need to enter in Chrome on their iPhone or Android device. It’s that special URL that allows the two devices to sync, and after a little calibration, gamers will be left to get their Star Wars on. While this may be a little bit of fun, Google isn’t messing around and has made the whole thing official by getting the buy-in of Disney and Lucasfilm. The whole thing looks, sounds and just feels like a real, licensed title. In fact, if you turn the sound up on your lightsaber – we mean smartphone – then you will even be treated to the trademark, universally recognized sounds that the weapon makes. If all this sounds cool and awesome to you, and it really should, then head on over to the Google’s Lightsaber Escape website, put your smartphone in hand, and get ready to take on some Stormtroopers. Good luck, and try not to swipe everything off any shelves you may have nearby! Not to be outdone, earlier today Facebook has also enabled a tool that lets you add a lightsaber to your profile picture. Because, why not? Your need to comment “no thanks” is just stupid. Tried it on a Windows 10 using Chrome and iPhone 5 using Chrome. Both showed the right page but no connection.